The powder coating line, built in 2018, allows us to processing components with maximum dimensions of 1.0 x 1.5 x 3.0 m. It is important to maintain an even temperature at every point within the oven during the entire heating cycle in order to ensure the quality of the colour. A specially developed and electronically controlled solution makes maintaining temperature in our oven possible. The pre-processing of components is equally important for good adhesion and corrosion resistance. 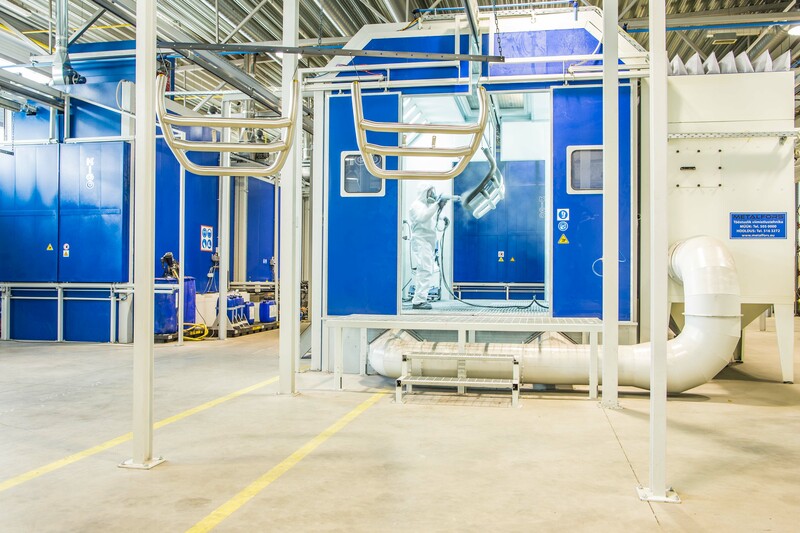 Our pre-processing process integrates degreasing, neutral etching and the installation of a special corrosion-resistance increasing base layer called “Oxcilan“ to the components to be coated. Components finished with our technology, depending on the characteristics of their construction, will remain without significant corrosion damage up to 1 000 h in the salt cellar test.